David Cobb (1921-2014). Oil on canvas; signed (LL) and annotated "BIRMINGHAM and MANCHESTER off Iceland May 1941" (LR). In mid May 1941 word was recieved by the Admiralty in London that the new 15 inch battleship KMS BISMARCK (Kapitan Ernst Lindemann) flying the flag of Admiral Gunther Lutjens, and the 8 inch heavy cruiser KMS PRINZ EUGEN (Kapitan Helmuth Brinkmann) were again preparing for sea, possibly this time for a co-ordinated breakout into the Atlantic to harass British shipping. Although this event had long been anticipated by Admiral Sir John Tovey, Commander-in-Chief of the Royal Navy's Home Fleet, the immediate priority was to try and ensure that all possible routes into the Atlantic were covered by his forces to guard against the breakout: a tall order indeed as there were three such practical routes that offered the German squadron a chance to gain the open Atlantic. The most southerly one, the Shetland/Faroes Gap offered Lutjens the shortest route but the highest chance of detection by the patrolling British; next came the Faroes/Iceland Gap, a longer route but very much wider and more difficult for the Royal Navy to cover; and the most northerly route, the Denmark Strait bordered to the south by Iceland and to the north by the ice edge which lay to the south of Greenland. This latter route would be much the longest of the three for the German squadron and although relatively narrow offered the best chance of evasion, largely because of the foggy, icy conditions which typically prevailed there in May: perfect cover for the two ships to slip through the net. Tovey would simply have to cover all three possible routes until he had more precise intelligence. Accordingly he instructed his Chief of Staff, Commodore Patrick Brind who had recently joined the staff from commanding the light cruiser BIRMINGHAM on the China Station, to put into force the plans that had been laid to reinforce all three passages. The heavy cruiser HMS NORFOLK (Captain Alfred Phillips), flying the flag of Vice Admiral Frederick Wake-Walker and already on patrol in the Denmark Strait, was to be joined there by her 8 inch sister cruiser SUFFOLK (Captain Robert Ellis); and the light cruisers HMS MANCHESTER (Captain Herbert Packer) and her sister BIRMINGHAM (Captain Alexander Madden), already on the Iceland patrol south of the Denmark Strait, were to be reinforced by another light cruiser, HMS ARETHUSA (Captain Alexander Chapman). How 'Daddy' Brind must have enjoyed ordering his old ship BIRMINGHAM to reinforce the Iceland patrol thus giving her a chance to be in on any action that might be forthcoming! 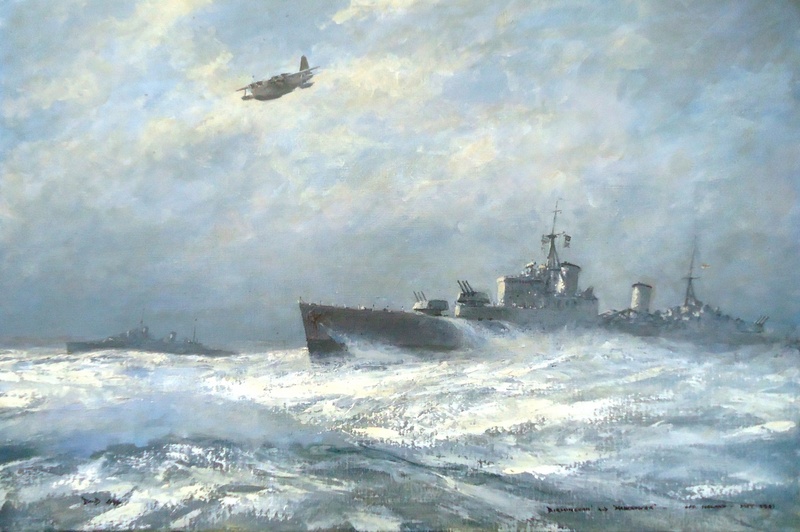 And this is the scene in the Iceland/Faroes gap that David Cobb has painted: the two cruisers (MANCHESTER in the background, BIRMINGHAM nearer us) as they flogged their way through a full gale and cold, heavy seas whilst a Sunderland flying boat of RAF Coastal Command lends recce support from the air. Cobb, then a junior naval officer himself and who in the latter stages of World War 2 spent a great deal of time in the thick of the actions in which Coastal Forces were involved, gained a reputation for his superbly executed seas - possibly honed from his time in small, fast warships and as an officer aboard escorting destroyers on North Atlantic convoys. Here of course he would have witnessed plenty of big seas, curling wave crests and icy, lashing spray as he has so skilfully painted on this canvas. He went on to become President of the Royal Society of Marine Artists and to be appointed Honorary Artist to the Royal Yacht Squadron and his works are greatly admired and much collected.